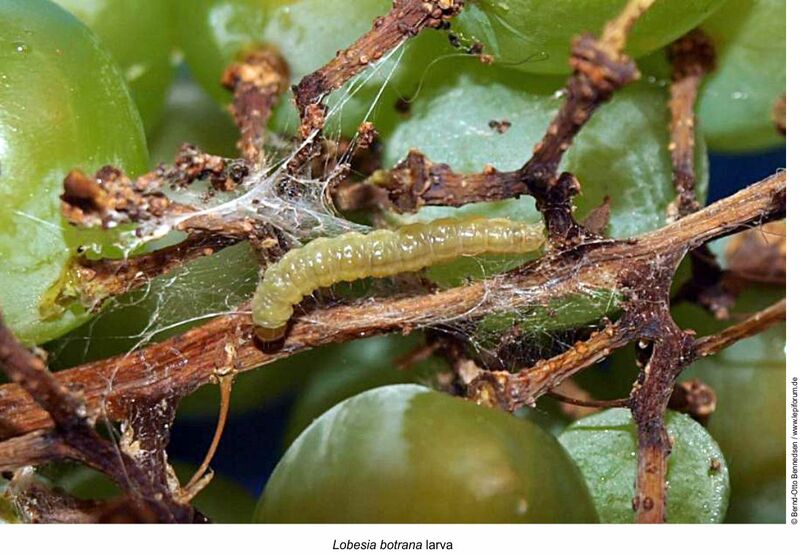 Lobesia botrana belongs to the family Tortricidae and is possibly the most harmful pest for vineyards in our country. It is also known as grape fruit moth, grapevine moth, etc. There are other species recognised as grape moths, such as Eupoecilia (Clysia) ambiguella and Cryptoblabes gnidiella. However, the most harmful and widespread is Lobesia botrana. Clysia ambiguella is only relevant in the most humid areas of the north. This species causes damage to vineyards of more humid countries, such as France or Northern Italy. The adult is 12 mm wide and its wings are brown with light and dark tones. The larva is a green or brown colour with a brown head. The pupa is protected by a white silky cocoon. The eggs are a yellow colour and flat. They are laid individually on the fruits, looking like small drops of wax. It hibernates as a chrysalis inside the peel of vines, but also in the ground or margins of the leaves. The adults emerge in stages during spring and fly at night. The first generation lays the eggs on the corolla of the flowers. Each female lays 50 to 80 eggs that hatch approximately in a week. The larvae grow inside the bunches of grapes and create masses by joining floral buds with silk threads. They pupate in the leaves or in the peel of vines and a new generation of adults hatches. 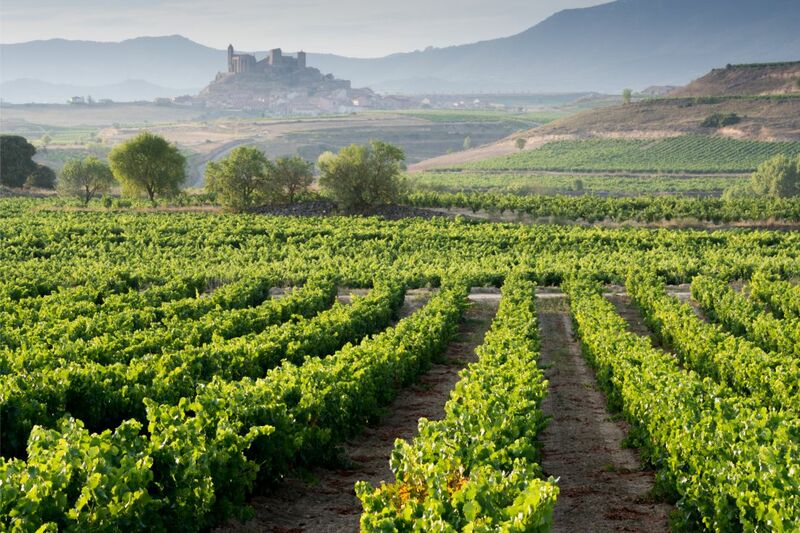 The adults of the second and third generations lay their eggs on the grapes, preferably on the smoothest and driest. They look for shaded areas protected from desiccation. The presence of humidity or sulphur powder on the bunches of grapes prevent the egg laying. The number of generations can vary from 2 in regions with a colder climate, to 3 in Mediterranean regions and the south. However, the number can change depending on the climate of each year. 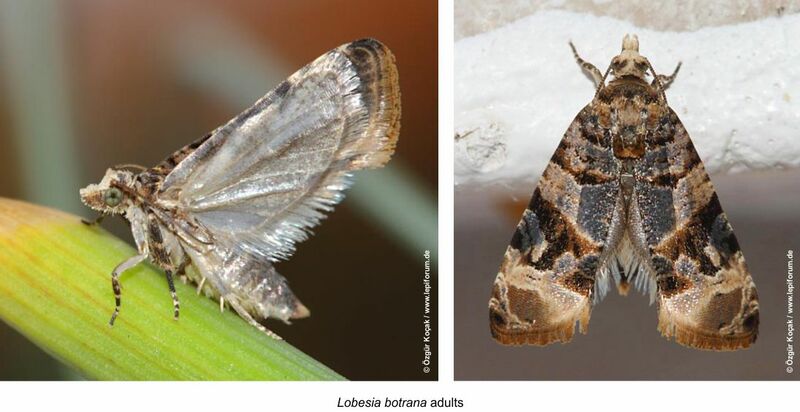 The optimum moisture content for the growth of Lobesia botrana is between 40 and 70%, whereas for Eupoecilia (Clysia) ambiguella it exceeds 75%. The high temperatures and dryness of the summer can cause serious mortality in the eggs. The development threshold for the larvae is 10 OC. The photoperiod establishes the entrance into diapause. The insects, originating from the eggs laid after July, go through diapause turning into a chrysalis. All these climate factors influence in the development of the pest and therefore in the damages that it can cause, which are more severe because it produces three generations a year. The first generation causes damage to the floral buds and flowers, but it is not very serious because it does not affect the quantity or quality of the harvest. The second and third generations cause direct damage to the grapes by entering and feeding on them. This means a depreciation of the grapes. 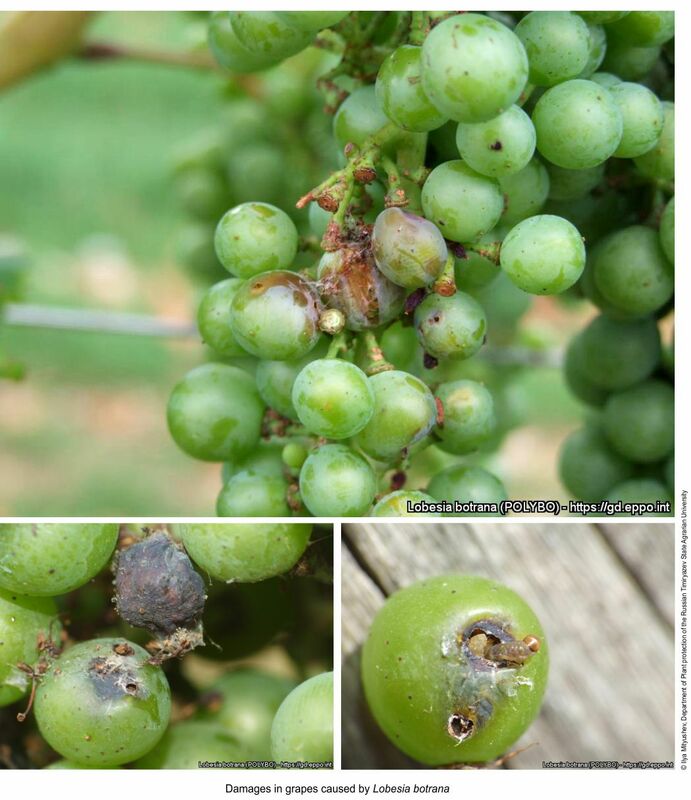 The most important damage, caused by larvae of the second and third generations, consists of open wounds in the fruits that cause serious rotting of the bunch of grapes (mainly Botrytis). 1 to 2 traps per hectare should be placed at the same height as the crops, in vineyards or on specific supports. The traps should be placed at the beginning of the flowering period. The males of this species are specifically captured in order to reduce mating, meaning that the unfertilised females will lay unviable eggs. This greatly reduces the population of the pest. For mass trapping, the amount of traps per surface area must be increased, depending on the location and uniformity of the plots. One trap controls a surface area between 500 and 1.000 m2. This means a density of 10 to 20 traps per hectare. 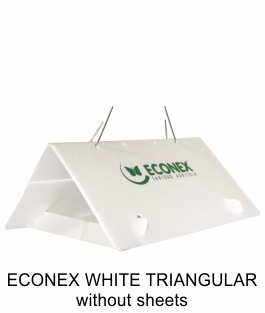 ECONEX WHITE TRIANGULAR without sheets (Code: TA118). 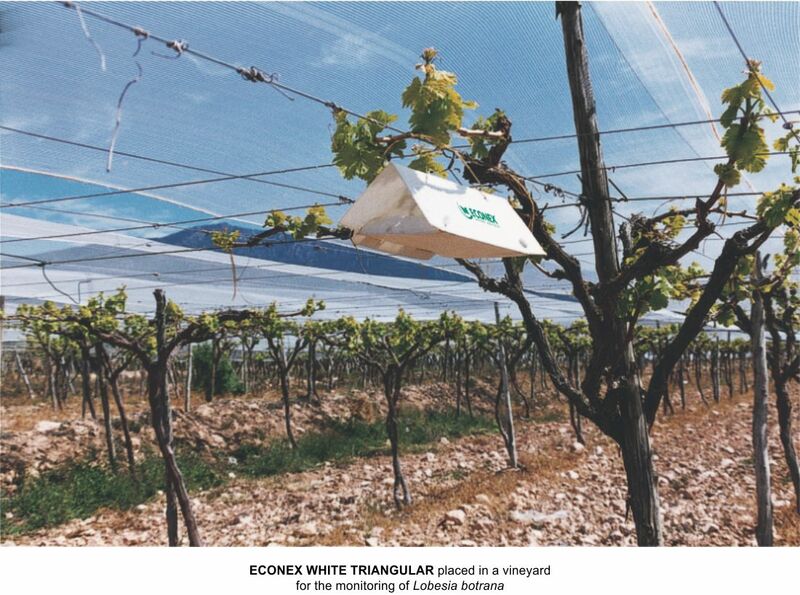 The trap is activated by placing an ECONEX SHEET FOR TRIANGULAR (Code: TA248) on its base. The sheet is impregnated with a pressure-sensitive adhesive, without solvents, in which the insects are trapped. The trap includes a hanger made of a special wire. 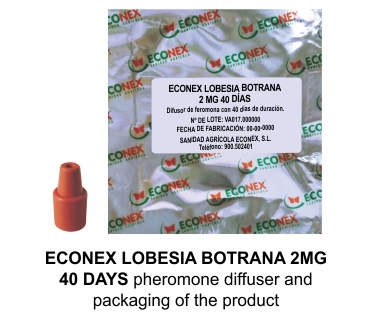 ECONEX LOBESIA BOTRANA 2 MG 40 DAYS attractant diffuser to be placed on the adhesive sheet. ECONEX WHITE TRIANGULAR without sheets stands out mainly because of its simplicity of use. It will function until the pheromone runs out or the adhesive sheet is saturated. To obtain good control of the European grapevine moth, it is advisable to combine two methods: detection and monitoring; and mass trapping. In spring, 1 to 2 traps per hectare should be placed for the detection of the pest and observation of its population levels. With tolerance thresholds established in each area, the moment to adopt control measures, in this case mass trapping, can later be defined. The tolerance threshold for Lobesia botrana is very low and varies depending on the area. In general, captures per trap and per day are between 1 and 3. The pest population, the bordering crops, the level of control required, etc. One important factor is the size of the crops. In small and irregular crops, a greater number of traps are required than in larger and more uniform plots. Another important factor is the distance between plots that have Lobesia botrana. In cases like this, the borders of the plots must be reinforced, so it could be necessary to place up to 20 traps per hectare or even more for mass trapping. If specialists or farmers use the traps and pheromones correctly, as previously described, especially during the early stages when adults of the first generation appear, then this monitoring system is very effective. A very low level of damage, mainly on organic land, has been demonstrated. A level of control of more than 95% is quite common, especially in large areas of crops. A limiting factor of this system is the presence of small plots surrounded by others that have a high level of infestation of Lobesia botrana. Despite some important basic rules for an effective control of Lobesia botrana, every farmer or specialist has to find their own system of control to achieve it. They can experiment with this system, even establishing their own tolerance thresholds. Box size: 0.60 x 0.40 x 0.35 cm (length x width x height). No. of boxes per pallet: 20. 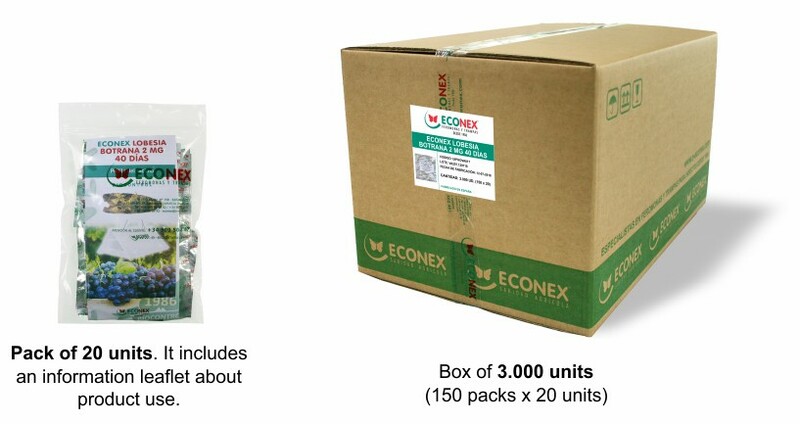 Section of the ECONEX corporate website that allows you access to online information about ECONEX solutions for the biocontrol of other relevant agricultural and forest pests.